A children’s book anthology of newer stories inspired by original Robin Hood stories, these are updated, easy to read, and rekindle the love of the original. They are best for older (10 an up)…but they are genuinely fun, and each and every one has a terrific lesson to offer children. Many of the stories involve children, and a young Robin Hood, which makes the collection in this children’s book even more appealing to children. Often, I prefer the original of any classic children’s book. Yet there is something appealing to seeing what happens when contemporary children’s book writers apply their own imagination to a classic theme. Robin Hood is living mythology, in many ways, and so it feels appropriate for the legends to continue to grow over the centuries. I appreciate Jane Yolen’s introduction to the collection, and of course, she herself is a favorite children’s book writer. I would imagine you might introduce children to the original versions first, and then when they hunger for more stories, this is a nice collection to offer. The last story in this children’s book is a modern computer fantasy that I would have left out of the anthology, as it feels very jarring to the theme. However, the quality of the other stories outweigh my misgivings about that one story. 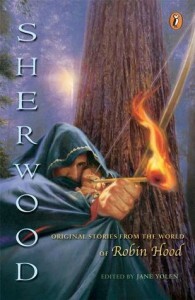 I especially love the opening stories, which provide a mystical, fairy-realm background for Robin Hood, one that is sure to spark interest and questions.